Pfizer, multinational leader pharmaceutical laboratory, offers over the counter -OTC-products, advertised to the massive market. 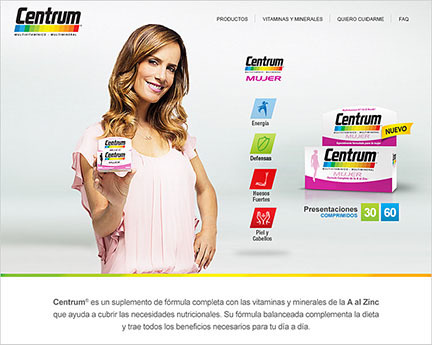 The company’s objective is that Centrum Multivitamin, leader in the OTC category, can be easily found in the digital world being the major source of information for users. CONTENT MARKETING ENGAGES WITH BRANDS, THROUGH RELEVANT CONTENT CREATION. 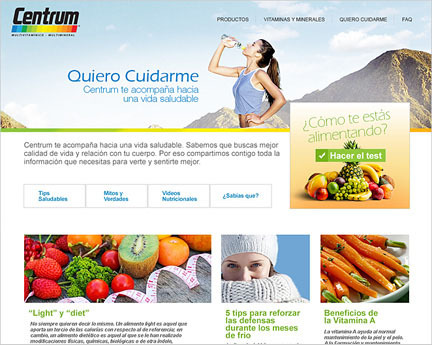 Centrum is a recognized brand in the Latin American marketplace, positioned in the point of purchase and leader in its category. The company aims to expand its potential customer base creating the need through information and know-how. In this outline the strategy prioritizes contents and seeks to become the referent in health care and quality of life, in relation to eating habits, physical activity, stress reduction, third age care. To achieve it, the site is developed and a special section “Taking care of myself” guides the user to a healthier lifestyle. It features an endorser in video format, nutritionist Dr. Monica Katz, presents life situations in which people find themselves under increased demand and recommends how to cope. Also, a test can be taken to evaluate one’s eating habits, suggesting tips to sustain a healthy lifestyle, referring to vitamins myths and facts and providing useful information about food. Also, since this subject could be difficult to understand for a non-medical public, a friendly language is used to explain the impact of the vitamins and minerals in each part of the body as well as which are the foods containing each of them. All this content is positioned in the digital ecosystem, blogs and social networks with the objective of being relevant to the pursued target, and in this way reaching more people and increasing the traffic to the sites Centrum Argentina and Chile. Content marketing’s purpose is to attract and retain customers by consistently creating and curating relevant and valuable content with the intention of changing or enhancing consumer behavior. The essence of this content strategy is the belief that if we deliver consistent, ongoing valuable information to buyers, they ultimately reward us with their business and loyalty.